Shiner and I had some fun on Cheezburger the other night. While we won't be having any real snow avalanches here in Texas, I don't think that Shiner really minds this pillow avalanche all that much. I was thinking the exact same thing...doesn't look like Shiner minds. Best kind of avalanche to have! Ha ha, we know that one! Have a wonderful wordless Wednesday. You can never have too many pillows, right Shiner? Shiner loves her pillows Wrigs! Pillow avalanches are always the best. A pillow avalanche is much preferable I'm sure! I think so guys. We aren't big fans of snow! :-) I am the king of making a pillow avalanche! Great photo! Comfy and cute fur sure! Shiner, did you get buried by pillows?? That looks like kind of fun. Have a super day. This has to be the best avalanche ever! shiner: ceiling cat N basemint cat wood approov !!!! 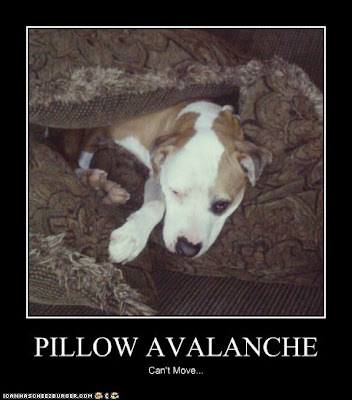 Ahhh, my dogs would LOVE a pillow avalanche! They love anything related to pillows! Adorable! Love that face! Hugs & belly rubs! Actually, Shiner looks like she's having a great time! Happy WW! Yes, my cair terrier often has to "dig" her way out of these pillow avalanches! Have fun Shiner!! That's cute. Livia has her favorite pillows, too. Aw, she has her own poster now. Fun stuff.